Rare is the occasion when an artist arrives on the scene who fundamentally reawakens your understanding not just of music but world history, common cultures, and shared values. Dongfeng Liu is this very type of artist. He is a maestro composer, arranger, jazz pianist and educator who draws upon musical influences from his native China, and fuses them with American jazz harmonies with Caribbean rhythms. China Caribe uncovers those buried pages of history in which Chinese immigrants journeyed to the Americas as early as the 1860s. In fact, Havana boasted the largest Chinese population in the Western hemisphere during this period. Liu’s CD celebrates and dramatizes these cultural cross currents. On this album, we hear what happens when cultures collide  a new sound, a unique aesthetic is born. You haven’t heard anything like China Caribe. I hadn’t. In a word, Liu’s music is peerless. These eight original compositions and arrangements are special and sparkling, meditative and magnificent. The opening notes of In the Clouds are performed on the morin khuur, a Mongolian instrument that is also called a horsehead fiddle, in soundclips by the Hanggai Band, one of the leading folkloric Rock groups from Mongolia, and friends of Liu’s. 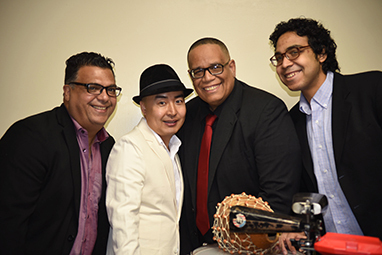 This sound alone foreshadows what’s to come: We begin in the East, but by the time John Benitez’s round electric bass enters, we’re not quite back in the West but somewhere in between  a place that China Caribe will inhabit throughout each musical chapter. Min Xiaofen plays the melody elegantly on the ruan, a traditional Chinese string instrument similar to a lute, with a round body and four strings. This piece is inspired by the Mongolian throat singing tradition called khoomei in which a vocalist sings two notes at once. In this tune, there is the sustained bass and melody. At the same time, the floating chords, taken together, form the second note. Indeed, the piece is masterfully conceived and arranged. 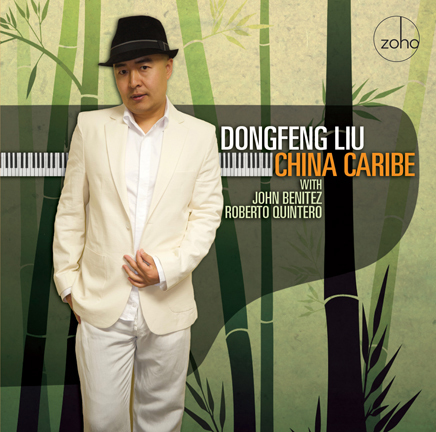 Mirror Image features Liu with well-placed piano lines, Roberto Quintero on percussion, and Francis Benitez on drums. The melody of the beginning A section is adroitly inverted into a 6/8 feel in the B section. Liu suggests that when we gaze at ourselves, look more closely, because there is more going on than meets the eye. Similarly, when you encounter others, don’t just look for differences, but identify the shared values that we hold dear. We’re more alike than apart. Colorful Clouds Chasing the Moon takes the melody from an ancient and folkloric Chinese song. Min Xiaofen takes the lead on the pipa, another ancient lute-style stringed instrument. She is followed by Liu performing the melody on the piano. There is a trenchant Afro-Cuban beat in 6/8 that creates an undulating, propulsive feeling until the timba 4/4 rhythm takes over during the solo section, in which Liu unleashes an incandescent improvisation that builds with block chords and dynamic phrasing. I Know You starts with the intrepid hand percussion of Roberto Quintero which blends seamlessly into John Benitez’s syncopated bass groove. Indeed, the prelude and A section are in the odd-meter of 5/4, which transitions to 7/4 in the B section. “Latin music makes people want to dance,” says Liu. “But this piece isn’t suitable for dancing,” he observes. He notes that this is one of his favorite songs because the musicians have to interlock over an uneven rhythm, and ultimately have to learn about each other in the process. This piece is unadulterated virtuosity. Arcadia is pure fusion. From the heavy synthesizer introduction and forceful back beat of the drums to piano painting and finally the melody on pipa. Liu chose the name of the song because it sounded like that of another world, the feeling he tries to evoke in this piece. Ultimately, the music is harmonious and suggests that it’s possible for people to make music (and live together) in a peaceful manner. Here too, Liu’s piano solo is pitch perfect, inhabiting the empty space, yet not clustering the piece with a barrage of sounds. The maestro uses the stillness, the calmness as an instrument itself which serves to dramatize the melody. From left: Roberto Quintero, Dongfeng Liu, John Benitez, Francis Benitez. Photo: Melanie Futorian. Coltrane’s Tune is Liu’s tribute to John Coltrane, whom he has long admired. The harmony is from Coltrane’s classic “Countdown.” Liu admits that the song is also inspired by Miles Davis’ “Tune Up.” Indeed, you can hear shades of both these vintage jazz songs. Of course, Liu renders them with novelty and originality. This tune is pure, uninhibited jazz trio. Fisherman’s Song At Dusk comes from an ancient Chinese folkloric song. It refers to the performance of the Chinese Jiangnan Water Village during the sunset, as the fishing boats are sailing in the distance. Liu took this melody and recast it with several parts, from the cascading piano to the drums accenting the beats at the same time. Feifei Yang plays the melody on the erhu, a traditional Chinese bowed string instrument. The album concludes with Moophy which is inspired by an instrument known as the “Moog Sub Phatty,” which Liu thoroughly enjoys playing. The A section has a terrific 7/4 groove that transforms into a 5/4 feel in the B section. The back-and-forth between Liu on the piano and Benitez on bass is the stuff of not just virtuosity but friendship. These two have forged a bond across idioms, styles, and cultures. Admittedly, to say that this album is Chinese and Cuban can be reductionist. There are fifty-six ethnic groups in China alone who speak different languages and perform their own styles of music. Cuban and Afro-Caribbean music is certainly not without variety either. But this album will launch any listener onto a journey, even safari of discovery. It has been a pleasure producing Liu’s album with John Benitez and Doug Davis. We thoroughly enjoyed the adventure of fusing cultures and civilizations. “I wanted to contribute a new voice, my voice to the conversation,” said Liu. Indeed, Liu has given us something to hold dear as we face the future. No matter the shifting sands of time and fate, we’re in a better place when we look for commonality. Liu has enriched and advanced that common language of all mankind  music. Produced by John Benitez, Kabir Sehgal and Doug Davis. Recorded on October 24, 2017 at Teaneck Sound, Teaneck, NJ. Recorded, Mixed & Mastered by Brian Chirlo. Art direction and Package Design by Jack Frisch. Photography: Melanie Futorian. Liner notes: Kabir Sehgal. Executive producer: Joachim “Jochen” Becker.